With the development of ZYTO biocommunication, it is easy to identify your body's biological preference for things relating to your health. Reports from your ZYTO scan provide you with information that may help identify your individual needs such as nutritional support, appropriate medication, or clinical asssistance. Identifying items to which you have an unusual response gives you and your healthcare provider insight about health-related issues that may be keeping you from functioning at a balanced state. Does one size fit all when it comes to nutritional support? Of course not! ZYTO scans identify your body's unique positive responses; we call these your biological preferences. Knowing your biological preferences helps you and your healthcare provider choose the nutritional supplements that will support your individual health needs. There are a lot of good nutritional supplements but you probably don't need them all. Knowing your biological preferences helps you choose products that are right for you. Choosing well means your investment in supplements is more likely to pay off, providing you the benefits you need and saving money on things you don't need. Your body consumes energy in its effort to maintain a healthy balance. When your body uses this energy to deal with life's extra challenges, like fighting a cold, you will have less energy to perform your day-to-day physical activities. ZYTO helps you identify the additional support your body may need to maintain balance and keep your energy levels hight. By providing your body extra help when it's needed, you're more likely to address issues while they are small, leaving you with more energy to enjoy life. 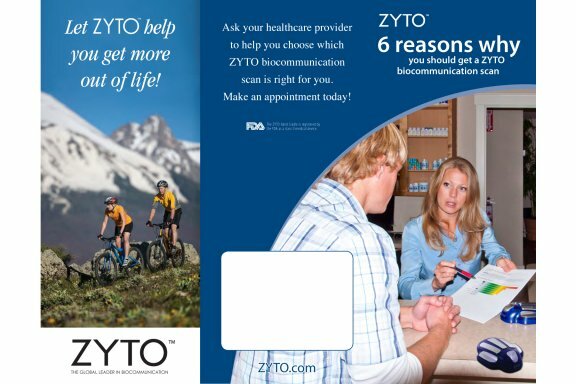 ZYTO biocommunication scans give you information "in the moment." Tracking your scans over time can be beneficial, allowing you to identify trends or long term issues that your will want to pay particular attention to. Keeping track of your past can help you predict the future, and reviewing your past ZYTO reports gives you essentially a look back through time. Have you ever asked a sick toddler or a child with autism how they are feeling? Even for adults, using words to explain how you feel can be a challenge. Biocommunication opens up entirely new communication, a second perspective is established that can provide helpful insights and information about your health.